Numerous hand crafted works of art are displayed at Camai Bed and Breakfast in Anchorage, Alaska, for guests to enjoy. The women in Caroline’s family have worked and continue to do cross-stitch, crazy quilt, needlepoint, painting on silk, and borgello. Abbey Naumen (daughter-in-law), Cecilia Smith (daughter), Gwen Dunbar (mother), Betty Dunbar (sister-in-law), Meta Pillsbury Dunbar (paternal grandmother), Mary Louise Pillsbury, Libby Dunbar (sister), and Caroline have works displayed throughout the B&B. When Abbey was in high school her violin teacher had her students do a “senior” recital. Abbey asked Caroline to accompany her…which Caroline did with joy. Since Caroline would not take money for accompanying her, Abbey made a cross-stitch and gave it to Caroline. 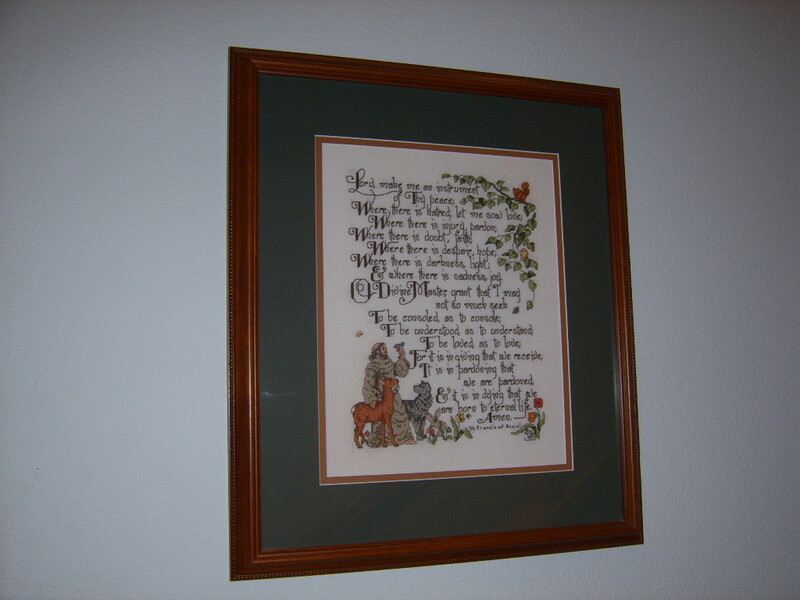 The cross-stitch is of the Prayer of St. Francis. This is hanging in the B&B’s main entrance. At the top of the stairs on the living room level is Cecilia’s latest cross-stitch masterwork. Cecilia began working on this when she visited Gwen after Gwen moved to Oregon to live in a retirement community. Gwen eventually moved to the assisted living section of the facility. Cecilia brought her baby and cross-stitch to visit her grandmother. Cecilia now has three young children. This past October Cecilia went to Illinois with Caroline and Howard (Caroline’s brother) to bury Gwen’s ashes. Cecilia took the cross-stitch out again and worked on it. Once the work was completed Cecilia decided to give it to Caroline for Mother’s Day. Cecilia sent it to her sister-in-law (Abbey) who washed it and ironed it. Abbey and Kit gave Caroline the frame. This is a most treasured piece. When Gwen was first married she made needlepoint seat covers for all of her dining room chairs. Caroline’s sister, Libby Dunbar, obtained at least three of these needlepoint chair seats. Libby framed them and gave one to Howard Dunbar, one to Caroline and kept one. 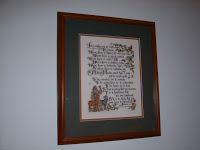 The needlepoint given to Caroline is hanging in the living room of the bed and breakfast. When Caroline was in sixth grades she had a severe case of viral pneumonia. Gwen wanted to keep Caroline occupied for the few hours a day that Caroline was awake. Needlepoint was Gwen’s answer. The two pieces Gwen had Caroline work were eventually completed by Gwen. These hang above Caroline’s piano at the bed and breakfast’s common area. Grouped with Caroline’s two needlepoint works is a cross-stitch of an angel, one of Cecilia’s early works. On the piano bench is a needlepoint cover which Meta made and which she had on her piano bench in Illinois. Gwen and Meta embroidered many pieces which were used on a daily basis. Parts of the hand towels, napkins, tablecloths, and bed linens were soiled beyond cleaning. Several of these pieces were given to Betty. Betty created a crazy quilt out of the good, clean remnants from Gwen’s and Meta’s work. The crazy quilt is framed and hanging in the Rose Suite. Also hanging in the Rose Suite is a painting on silk which was done by Mary Louise Pillsbury circa 1902. At breakfast, Camai B&B’s guests sit on the dining room chairs which are a combination of needlepoint and borgello. Each one represents a state flower. Craig’s sister, Lynne Worth, did them for her mother. When Mom (Peggy Lane) remodeled, the chair covers no long fit her décor. She asked Craig and Caroline if they wanted them. Yes, was the answer! Craig is trying to encourage either Lynne or Cecilia to do two more seat covers. One would be of the “forget-me-not” which is Alaska’s state flower. A folder of pictures of each art work can be found on Camai Bed and Breakfast’s Facebook page. This entry was posted in Uncategorized and tagged art, borgello, cross stitch, needlepoint by admin. Bookmark the permalink.